Sandwiched between the Ligurian Sea and the Alps and Apennines, the Italian Riviera is a narrow coastal strip with a string of places to visit, from upscale seaside resorts to fishing villages. It's enormously popular with both Italian and foreign tourists. You can easily escape the crowds by venturing farther away from the sea and sightseeing in the hillside villages of the inland area. The western section of the Riviera is touted for its roses, almonds, and citrus groves, while the eastern part features a much more rugged terrain and several nature and marine preserves. The Riviera's mild climate and its charming fishing ports have made it not only a popular holiday destination for tourists, but also an inspiration for artists like Byron and Shelley, both of whom traveled extensively here. 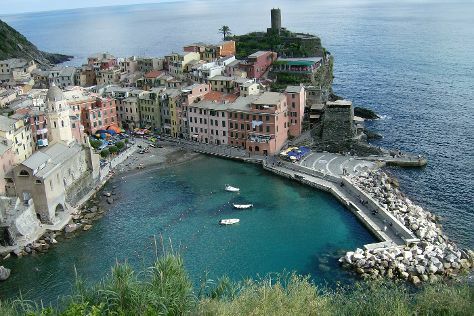 Italian Riviera is in Liguria. Take stress off the schedule by using our Italy trip planner .